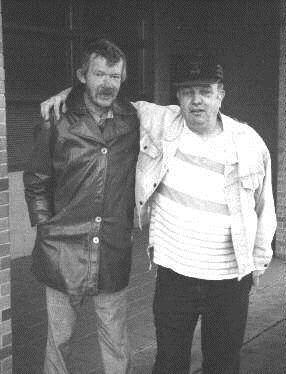 In 1973, six college students got an OFY grant to open a drop-in centre for the homeless. Open twenty-four hours a day at 506 East Cordova, the DIO became a favorite draw for the homeless. Next year the students went back to school and Catholic Charities took over. In 1984 the DIO moved to 373 East Cordova. Here too, things went well. However as the original spirit of the place passed on, an unsavory element found its way into the place. The Charities, to their credit, attempted to control the ne’er do wells but found it increasingly difficult. Gradually fewer and fewer of the homeless would visit – except to grab a cup of tea. Fortunately, along came Brother Timothy MacDonald, a Franciscan chaplain with ten years at Rikers’ Island Penitentiary in New York. He assessed the place, and found himself drawn to a mission: to create a safe harbour drop-in centre for the homeless. But he would need help. Within twelve months, The Door Is Open acquired a new look: it was painted, unsavory elements were put out, many new volunteers were found, and programs were started to convert a dingy institutional hall into a safe, friendly center where the homeless could socialize and have a nutritious meal .Now there is a place away from home where the homeless are welcome: a place to visit, to talk, to play cards or seek solace in the resources available to them. Here they are accepted for who they are – people. And that is why there is such a mix at this place. In 2014, The Door is Open moved to its present location at 255 Dunlevy Avenue. Today, the staff and volunteers at The Door Is Open go out of their way to show the homeless that they are welcome. Our door is truly open to them.